Despite the horrors of armed conflict, it’s probably not surprising how influential war has been on popular culture. Outside of the likes of cinema and literature, music has drawn from a wide range of battlegrounds to reflect public opinion or to offer up commentary, from iconic protest songs such as ‘Eve Of Destruction’ through to the pointed lyrics of ‘Oliver’s Army’ by Elvis Costello. 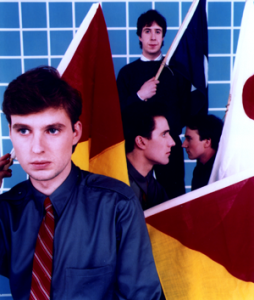 Growing up in the post-war years, it’s inevitable that bands such as OMD would draw on these strong cultural influences. Many of their earliest songs demonstrate this, such as the lyrics to ‘Bunker Soldiers’, whose regimented beats graced OMD’s eponymous debut album. Meanwhile, ‘The Messerschmitt Twins’ (another track from the OMITD album) was a phrase that Andy McCluskey had conjured up in his head, which prompted him to pen a song with the title. In fact while Andy was researching the history of the Messerschmitt airplane, a reference to the Enola Gay led him to write yet another song with a military influence. Every age has its cultural influences, but it’s difficult perhaps to explain just how influential conflicts such as the Second World War had on the post-war generation. Certainly the influence continued through the 50s and 60s resulting in classic films such as The Great Escape, The Dambusters and Bridge On The River Kwai. Subsequent generations were meanwhile also growing up under the spell of war-themed comic strips care of titles such as Valiant, Battle and the iconic Commando. This was where kids would inevitably pick up a raft of cliché phrases which included “Take that Jerry!” along with “Donner und Blitzen!” and “Achtung!” which would dominate playground games that revolved around a theme of war. Outside of these pursuits, it was also the height of power for Airfix – a model kit company who produced endless armies of tanks and airplanes that boys would spend hours gluing together before adding a paint scheme that was usual rendered with an unsteady hand (or it could have been the glue fumes…). One such airplane was the B-24 Liberator – a mass-produced aircraft which saw service during the Second World War, yet this American warplane was often considered difficult to fly, was prone to battle damage due to its lightweight construction and was usually not the plane of choice for aircrews of the time. Again, children in the post-war period could have a go at constructing their own versions of aircraft such as the Liberator care of Airfix. This interest in military issues would continue up to the early OMD songwriting period. “A lot of the war references are because I was interested in the lengths to which people would go in a situation beyond the norm” commented Andy in the Messages biog, “And of course the machinery of warfare tied the whole thing together – hence, ‘Bunker Soldiers’, ‘Messerschmitt Twins’, and my continuing fascination with aeroplanes”. Despite this fascination, it’s clear that Andy isn’t glorifying war or celebrating it in any way. “I don’t believe in fighting wars. I loathe violence and militarism”. 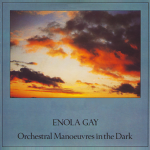 It’s this particular approach that perhaps can confound critics, particularly following the release of ‘Enola Gay’ in 1980. Considering that the song revolves around the controversial atomic bombing of Hiroshima in 1945, it’s perhaps not surprising that the subject matter would provoke questions. So while the historical event may play a part in the influence, there’s often more subtle ideas at play. Ideas about how wartime can change people and make them do things that they wouldn’t normally do under ordinary circumstances. This particular theme was explored not once, but twice, during the Architecture & Morality period with the release of ‘Joan Of Arc’ and ‘Maid Of Orleans’. Here was religious inspiration provoking a will to march into battle. It marked a period of fascination not just for motivations during a time of war, but also religion. It’s no surprise that ‘Telegraph’ had also been penned around this time – a particular song that did little to hide lyrical content that is clearly employing a metaphor for religion. By the time of the 1983 album Dazzle Ships, it was clear that this military influence was still a well worth drawing from. Peter Saville’s interest in the design concepts of the titular warships obviously struck a chord. In fact the Dazzle Ships tour programme also includes illustrations of dazzle-designed ships as well as a brief narrative about life on a warship (it’s worth noting that ‘Silent Running’ which features on the album is also a term for the stealthy manoeuvres of submarines). The promo shots of the band in this period also seem to suggest a very formal military dress code. The early interest in the B-24 Liberator also returned for the 1993 album that bore the same name. At this stage however, Andy had begun to be more inspired by more of the aesthetic elements of the warplane, such as the gaudily painted nosecone artwork that the planes displayed. The impact of the Second World War on culture had begun to wane by the time of the 1980s. But military themes were kept fresh by an influx of interest revolving around the Vietnam conflict. Although this was marked by popular feature films such as Oliver Stone’s Platoon, it was also reflected in music by such memorable tunes as ‘19’ by Paul Hardcastle. It also saw the revival of Edwin Starr’s ‘War’ which had originally been a protest song released in 1970, but had subsequently been covered by Bruce Springsteen (no stranger to protest songs, including ‘Born In The USA’) and also Frankie Goes To Hollywood. Frankie, of course, are probably best remembered for tunes such as ‘Two Tribes’ which had been inspired in part by the threat of the Cold War – a cultural influence that’s also all over Dazzle Ships. It’s a sign of the times that OMD have largely moved on from these strong cultural influences, which essentially belong to a place and time that is far removed from today (although the lessons remain). Despite this, even as recently as 2013, tracks such as ‘Dresden’ from the English Electric album harkens back to controversial wartime events. Shrugging off such cultural baggage can be difficult for the post-war generation. There was also perhaps an element of being one step removed from the true horrors of war through the veil of films and media. These days, in which armed conflict can be broadcast live on the internet, there’s no such fig leaf to hide behind. A younger audience might have an entirely difference frame of reference when listening to the likes of ‘Bunker Soldiers’ and ‘Enola Gay’. Yet the ambiguity of the lyrics for many of these songs still offers up a timeless quality that perhaps carries more weight than a traditional protest song.